Film promotions can be extremely tiring but for Sui Dhaaga actors Anushka Sharma and Varun Dhawan, "sab badhiya hai." In case you are wondering what we are talking about, we are referring to Anushka Sharma's latest Instagram post, in which she can be seen resting on a couch along with her co-star Varun. 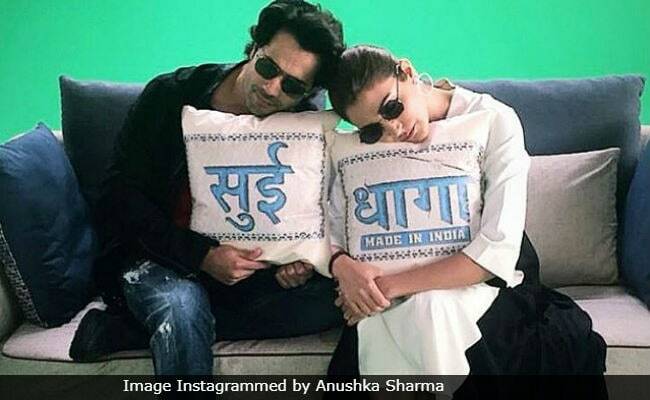 Going by the caption on her post, seems like Anushka and Varun, who were exhausted with all the work, decided to take a power nap during the film's promotions. In the picture, the duo can be seen wearing black sun glasses and resting their heads on cushions (with the film's name imprinted on them) and we must tell you that they look absolutely adorable. Anushka captioned the post: "Power nap during Sui Dhaaga promotions... Sab badiya hai." Anushka's picture received over 2 lakh likes on Instagram. Anushka Sharma and Varun Dhawan have been actively promoting Sui Dhaga. The duo recently joined Divyanka Tripathi Dahiya and Mohsin Khan on the sets of a special Ganesh Chaturthi show titled Ganesh Utsav. We got a glimpse of the event through Divyanka's Instagram post. Last week, Varun Dhawan shared a BTS photo from the film's promotional event on his Instagram profile and wrote: "BTS, Some crazy fun with this girl Anushka Sharma. She's obviously telling me not to do anything embarrassing." Remember the video in which Varun Dhawan wore a saree? The one in which he asked his fans: "Who wore it better, Mamta or Mauji ( the name of the characters played by Anushka and Varun, respectively)?" Sui Dhaaga is set against the backdrop of Chanderi, a small-town in Madhya Pradesh. The film touches upon the theme of Made In India. The film has extensively been shot in Delhi, Mumbai and Chanderi. Directed by Sharat Kataria and produced by Yash Raj Films, Sui Dhaaga will hit the screens on September 28.